Cameroon bridges West and Central Africa, and encompasses an intricate mosaic of habitats, ranging from tropical lowland rainforests in the south, to mangroves along its coastline on the Gulf of Guinea, to montane forests and savannahs as one travels north. The forests along the border with Nigeria are the wettest part of Africa and support the continent’s second highest concentration of biodiversity. Most—if not all—of the country’s many endemic species (those found nowhere else on Earth) live here. Cameroon’s extremely rich flora and fauna include well over 9,000 plant species, 910 bird species, 320 mammal species, 250 reptile species, and 200 amphibian species. The Cross River gorilla is the world’s most endangered great ape, with an estimated population of fewer than 300 individuals. The subspecies ranges across 11 scattered sites in Cameroon and Nigeria. Cameroon’s government created Kagwene Gorilla Sanctuary and Takamanda National Park in part to protect the Cross River gorilla. 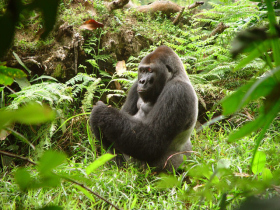 The gorillas of Kagwene have been protected from poaching by the local belief that the apes are people and therefore cannot be hunted or consumed. Streams flowing through Mbam & Djerem National Park, located at the northern edges of the humid forests of the Congo Basin, are tributaries to the biggest river in Cameroon, the Sanaga River. The river is the main water catchment for most of southern Cameroon and the park, providing water to humans, livestock, and wildlife as well as almost all the country’s hydro-electric power. Mbam & Djerem’s extraordinary habitat diversity supports more than 60 mammal species, 400 bird species, 65 reptile species, and 30 fish species. More than 70 villages with a population of approximately 28,000 people are adjacent to Mbam & Djerem National Park. Part of the lower Guinea Endemic Bird Area (EBA) with six bird species found nowhere else in the world, and Cameroon’s highly diverse habitat with lowland tropical rainforest, mangrove swamps and beaches to the south and west combined with Pro-Sahelian savanna in the northern provinces, makes it a birdwatchers paradise. The Cameroonian Highlands forests extend across the Cameroon Highlands, covering an area of 38,000 square kilometers (14,700 square miles) in eastern Nigeria and western Cameroon. The ecoregion lies above 900 meters elevation, and is surrounded at lower elevations by the Cross-Sanaga-Bioko coastal forests at the southern end of the range, and by forest-savanna mosaic along the central and northern ends of the range; the Cameroon Highlands form the boundary between the Guinean and Northern Congolian forest-savanna mosaic ecoregions. Cameroonian Highlands forests (World Wildlife Fund This is one of the least well-protected ecoregions in Africa. No part of this ecoregion is under formal protected status in Cameroon, although local traditional rulers still exert considerable authority over land use.